A live concert was the last thing on my mind when I stood at the Lamar Light Rail Station on a cold night in November. I wanted only to rush onto the train as quickly as possible, both to alleviate the chilling cold that had spread throughout my body and to capture one of the few remaining seats for the ride downtown. I happened to settle in next to a tall blonde man who held a dark wooden ukulele in his lap. I remember thinking to myself, “A man with a tiny guitar, now that’s interesting” only seconds before his deep baritone voice overwhelmed the train car. He sang a song of his own making, a love ballad, and accompanying his deep, distinctive voice were the confident strums of the ukulele. He played three additional songs that evening to the delight of everyone around him. 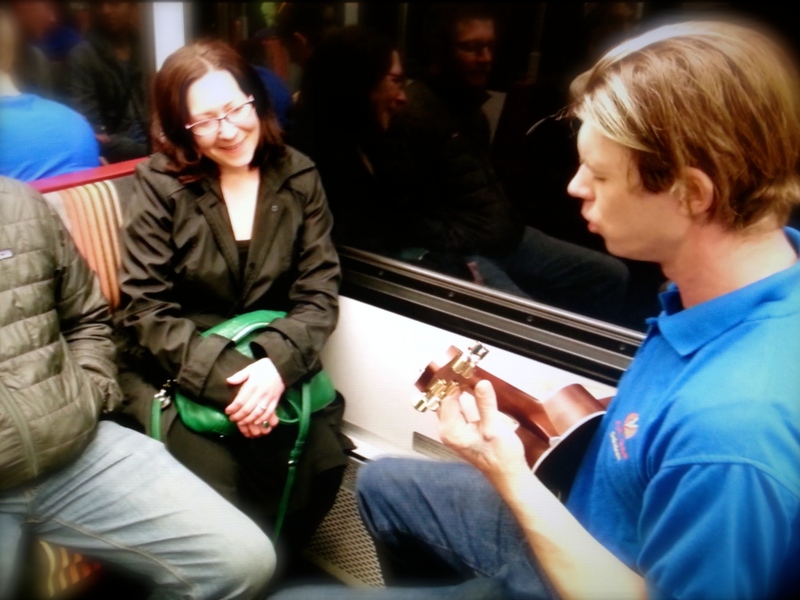 Christopher Scott plays on the W Light Rail Line as Molly Jenkins listens intently. Through a brief conversation on the train and a subsequent chat over a hot cup of coffee, I learned more about this musician who calls Lakewood, Colorado home. Christopher Scott has been playing music for much of his life. He reflected on this musical background in his own words. I asked Christopher to elaborate on his current projects. His face lit up as he explained a different side of his music to me. It’s a project geared toward children called Dusty Venus. The concept of community ties heavily into Christopher’s work and is one of the driving forces behind his desire to charm train-goers. Christopher’s final words to me were both poetic and aspirational. Christopher resides in Lakewood, Colorado so look for him on the West Light Rail Line. Attached are links to a short video of him playing for our group and to his Dusty Venus project.